BLU:72 Creative is a Nottingham based graphic design agency specialising in branding and logo design since 2001. We design and produce all kinds of promotional items, literature and publications, such as: brochures, annual reports, leaflets, flyers, prospectuses, banners (print and online), logos, stationery, advertising campaigns and packaging. Through eye catching graphic design, we help other businesses stand out from the crowd, grab attention and communicate what’s special about them, their products and services to their customers. 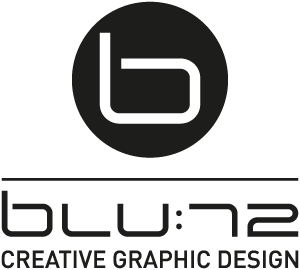 BLU:72 Creative have consistently provided me with creative solutions within agreed deadlines and budgets since 2001. In my experience, BLU:72 have shown a creative edge that has set them apart from other design agencies that I have worked with. I wouldn’t have been able to produce the high volume of marketing materials required in my previous role as Marketing Manager at Croydon College without the professionalism and creativity they offer. In my current role at Kingston University I have continued to use BLU:72 when the in-house design team has been at full capacity. I recommend them without reservation.